Decorating can be expensive. And for those of us who love to switch up our decor on a regular basis it can be really expensive! Fortunately there are some easy ways to decorate on a budget that will give your room a whole new look. 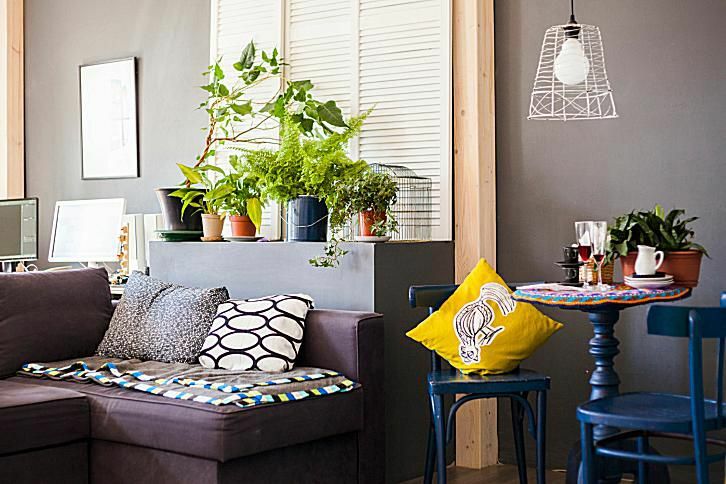 It's no secret that paint is the budget decorator's number one tool in transforming a space. With just a few dollars and a little elbow grease a whole room can be given an entirely new look. But painting the walls a solid color isn't the only answer. Imagine what a difference it would make if the ceiling in your living room was suddenly painted in a funky pattern, or all of the trim was painted a color other than white. Imagine a half-painted wall, or a feature wall. No matter what you decide, paint equals an instant transformation. Thrift store items have come a long way when it comes to people's perceptions. Second-hand stores are finally being appreciated as wonderful places to find unique and interesting items for your home - and a great find is something worth bragging about! Often it takes a little work on your part as many items require a little upcycling (new hardware, a fresh coat of paint, new upholstery, a little sanding and staining, etc.) but great thrift store finds can save you money and give your home tons of character. If you want to up your decorating ante sometimes all you need to do is embellish what you already have. For example, try adding a ribbon detail to plain lampshades, add new trim to your existing throw pillows, or add nailhead trim to pieces of furniture. One of the easiest ways to accessorize a room for free is by using items you already have but in a different way. For instance, use a side chair as a bedside table. Or decorate with jewelry that is normally hidden away in a drawer. Mount some vintage brooches in a shadow box, hang necklaces on a decorative ladder, or display just about anything in a pretty bowl. You can also take old china and display it. Hang pretty vintage plates on the wall or even display your silverware. A silver bowl or gravy boat looks very pretty when filled with flowers. One of the easiest ways of decorating a room in a new way is to rearrange the furniture - and best of all, it's totally free! When you're craving a new look but you don't want to spend any money try putting old things in a new place. And don't just stop at the furniture - rearrange your artwork and accessories as well. It will satisfy that craving without impacting your pocketbook. What you put on the walls has a big impact on the room, and there are a ton of things you can do for cheap.Try framing wallpaper or fabric samples, create washi tape art, or frame pages from old books. Or display your kids artwork by either framing it or hanging it from clothes hangers (it sounds wacky but it makes for a fun display!). The idea that artwork has to be expensive is a myth, so try making your own and don't be afraid to get creative. For more cheap and easy ways to update your decor check out the 15 Minute Living Room Makeover.